The craft beer industry has seen a lot of activity in recent years having to do with the resurrection of the use of wooden barrels during the aging process. While today’s brewers are producing many differing styles that employ wood vessels somewhere along the way, the history is a bit simpler. 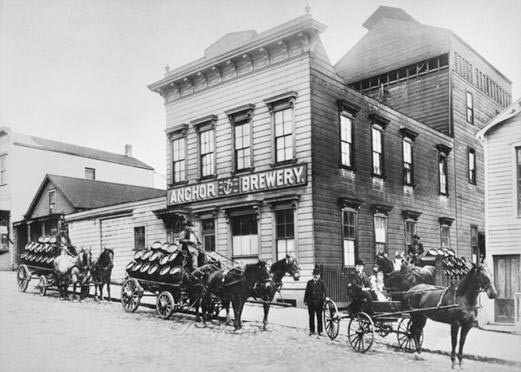 Back in the day, wood was the material that was used for the construction of beer barrels, storage vats, mash tuns, and just about every other brewery vessel except the brew kettle. This was the case with the wine and distilled spirits industries as well. In ancient times, wine was fermented, stored and transported in clay vessels known as “amphorae,” as were the original beers of Mesopotamia and Egypt. By the early centuries A.D., wood had replaced clay or terra cotta as the favored material for the manufacture of containers for the storage and transport of liquids, probably because of durability and ready access to raw materials. The classic barrel shape was an engineering design that added strength and provided for the cinching of the bands to bind the staves together. Somewhere along the way, it was noticed that the type of wood used for the barrel contributed to the character and flavor of the contents. Since barrels were expensive and labor-intensive to make, they were used many times over, often to hold different products. Again, it was noticed that the flavor of the contents could be affected — this time by the residue of the previous inhabitant of the barrel. The first time a new barrel is used, the nature of the wood and the length of time the product is held there will yield some character of that particular wood. If the same product is placed in the barrel time after time, there will be little if any effect on it, as the wood has yielded all that it has to offer by continuous use. 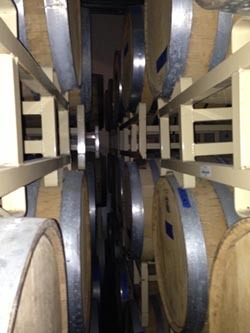 Secondary uses, as in sherry barrels used to age Scotch whisky, have become industry standards for some products; primary once-only uses, as in the production of Bourbon, for others; and continuous, same-product use for still others. Getting away from wine and whisky, which have their own extensive lore in this area, let’s move on to beer. Wood has played an important role in the brewing industry for centuries. For hundreds of years, beer was fermented in wood, aged in wood, shipped in wood, and served from wood. As previously mentioned, the wood ceases to provide anything to the product, except maybe bacterial infection (more on this later) after the initial use; and beer barrels were extensively reused. Wood is porous and notoriously difficult to clean. Beer shipped in wood has to be either consumed in short order or be preserved by heavy hop rates, high alcohol content, or both. A sort of preservation could be achieved by shipping beer that was still actively fermenting, or “cask conditioning,” an inexact methodology that depended heavily on the skills of the publican at the serving end. In any event, the use of wood in brewing was enthusiastically abandoned with the advent of metal kegs, fermenters, and storage tanks — for the most part, that is. There were a few styles of beer that depended on a specific bacterial infection to define their character, notably the sour beer category. When an unintended bacterial infection gets into a keg, the result is spoiled beer. However, a deliberate infection may be induced to produce a specific beer style. This process has been modernized but historically came about by the reuse of infected barrels. As the American craft beer industry blossomed, some brewers began using whisky barrels to age a few beers. The intent was to derive interesting flavors from the wood that were left over from its previous use. Since Bourbon barrels are only used once for whisky aging, they are readily available, inexpensive, and contain enough residual character to flavor the beer if it’s left there for a while. Rye whisky, rum, and even some wine barrels are being used in this way. Now, this is not to be confused with cask conditioning in the classic sense. Whisky barrels are not designed to hold a pressurized product and cannot be used for fermenting, which produces CO2, unless they are vented. Mostly, with a few exceptions, today’s process is really just a flavoring procedure in which a fully fermented and finished beer is held in a used barrel for a period of time. Often the brewer will simply “barrel age” one of their standard products. Other times a blend of several beers will barreled. Sometimes a special brew will be designed to take advantage of the possible flavor combinations. In all cases, the end product must be re-carbonated and is usually blended with a significant volume of unbarreled beer prior to sale. The length of time the beer remains in the barrel can be as little as a week or two, or can be as long as a few months to a year. It just depends on the brewer, the type of barrel, and the intended result. Due to the extra time and expense involved, barrel aged beers are typically sold at a premium and are usually in short supply. 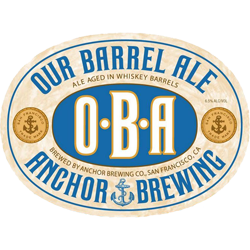 Anchor Brewing Company has been making a barrel-aged beer for several years using rye whisky barrels from our own distillery. The quantities are limited due to the fact that we generate very few used barrels. Since we control the barrels, we can fill them with beer shortly after they are emptied of whisky. The longer an emptied barrel is stored, the more it will dry out and the less character it will yield to the beer. Our Barrel Ale, or OBA as we call it, starts with out with several of our ales that have compatible hop profiles. These ales are then proportionally blended by the brewmaster, run into the freshly emptied rye barrels, and then stored in our cellar. The length of time the beer is held there has varied, as has the blend of ales. OBA is then blended in a tank with a portion of our regular ales and allowed to re-carbonate before it is packaged. Usually available only as a very limited draught release from time to time, OBA was once packaged in magnum bottles, which were used only for special events. 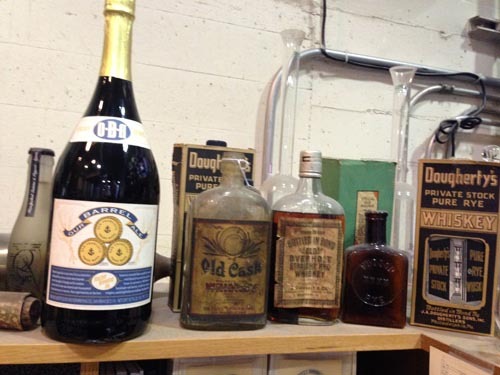 A magnum of OBA and several prohibition-era whiskey bottles. Given the creativity of today’s craft brewers and the variety of barrels available, the process has many possibilities for producing unique and interesting beers. A few breweries have gotten into this in a big way, with over a thousand barrels in use. There are even a couple of small producers that plan to offer barrel-aged products exclusively. Fortunately for those of us who enjoy these unique beers, we can look forward to barrel-aged beers from a wide variety of producers for years to come.